To win, tell us (or show us — upload a picture!) in the comments section below what you’d do if you won one of these beautiful limited edition Mondo Star Trek Beyond posters. Is this poster just the thing to complete the shrine to Chris Pine you started making in your bedroom? Or perhaps you need it to complement your (also gorgeous) Mondo Star Trek II vinyl album (I know that’s what I’d use it for). The contest ends Monday night at midnight PST. UPDATE: We have now closed the comments and will soon be choosing winners! You’re going to want to snag one of these beauties if you can. 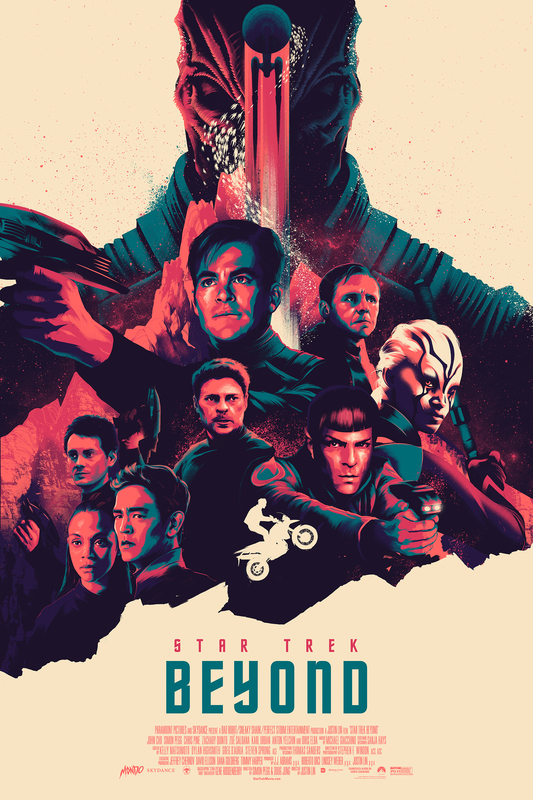 The poster was commissioned by Paramount in conjunction with Mondo and artist Matt Taylor to celebrate the Digital HD and Blu-ray release of the Star Trek Beyond. which is available now. This limited edition poster is not for sale, but TrekMovie is giving away THREE posters to three lucky winners. I would share it with my little Trekkie! I’d love to take it to cons and try and get everyone pictured to sign it, the space in each of the corners is perfect. This poster is georgous! I am trying to collect all the posters from Beyond, just ordered the homage poster to TMP, which is also really great! This would be a fantastic addition! I think it is hideous. But to each his own. This space in my library needs something unique and interesting. This would be perfect! I love and collect Mondo posters. This would go right next to my other Mondo Trek prints! Well, Star Trek Beyond is my favorite of the reboot movies, and I don’t actually have any Star Trek posters hanging up, which is weird considering that Star Trek is one of my favorite franchises. If I was going to have any Trek movie’s poster, this would be my first choice. I’d just like to frame it and put it up in my living room. I’m a school psychologist. I’d hang it in my office at school so I can spread the Star Trek gospel to the “next generation” of science fiction fans. My office has a spot right over my desk for this! It would be my first Mondo poster and I would love it! Interesting that it has the Enterprise-A on it. Cool. This beautiful poster would hang in the yearbook office at the California Institute of Technology in Pasadena, CA. The Caltech yearbook theme this year is “Beyond”—a not so subtle nod to Star Trek, which the editors (myself included) love. Our swatches were inspired by the TOS color palette: we have a retro goldenrod, steel blue, and brick red that we refer to as Kirk, Spock, and Montgomery Scotty. We’re bringing a classic sci-fi feel to the design of the book, and this poster would stand as a daily reminder of what we’re striving for—to take this yearbook above and Beyond everything that came before it, while still honoring the past. YES! Lets continue to see big bold adventures in a universe fully fleshed out in all it’s glory. Enough with these quit uninspiring series that feed us sudo space politics and unfeeling dumbo jumbo techno jargon. We already sen engh of that kind of Trek with TNG, DS9, STV and Ent. So caught up in that mishmash predictable story lines with bad dialog and redundant characters. They say they don’t want to see battles between ships and new alien encounters but they always resort with those ideas as long as it’s drowned in fake political droppings. Dammit Jim, it’s Star Trek before fans applied their self centered reverend views that slowly has been killing Star Trek for decades now. I’d frame this poster right next to all of my Ships of the Line centerfolds. Look at the that! Kirk, Spock, and McCoy right in the center, as it should be. Switch out with my current Star Wars 1977 poster in studio. Room needs more Trek. If I win it will help me in my plot to take over the world. Don’t ask how the less you know the better. I could tell you but then…well you know the rest. I would finally have a suitable piece to replace my own painting. My treker family will thank you – Nara, Rebecca, and our blind cat. I would give it to my son, the game artist (for I-can’t-tell-u in MD) for inspiration on their next generation of shooters. (And donate the saved holiday spending to a worthy cause). I would hang it next to my Enterprise poster in the study. If I won this I’d give it to my hubby for his birthday this month, he absolutely loved this movie. I would give it to my star trek fanatic sister for an awesome addition to her 50 year star trek collection ! I would use it to complete my star trek hual that I have been making, Magazines and books inluded. I would have it framed and put it next to my roommates Star Wars poster because it’s bigger and we all know Star Trek is better! I’d frame it and hang it next to my Beyond theatrical poster, above my Star Trek Funko pop collection, in the corner of my room devoted to my love of Star Trek. I will give it to my sister for an awesome addition to her star trek collection ! I have posters for Star Trek (2009) and STID in my office at work, and this would complete my poster trifecta perfectly!!! It would have a place of honor in the living room. It would make a great edition to my wall. Mostly because it’s empty and the only other poster is GOTG. If I won this limited edition )”star trek beyond” poster would be an honor….the franchise is truely iconic …I would first get a Frame that would make the poster stand out and it would be one of the pieces that you would gravitate towards….most people want to have art,color ,subject matter….reach out to them.to inspire them and say “that’s beautiful, or its cool…or where did you get that…..you want it to be a discussion piece……that is what my plans would be for this …….thank you….. I would add it to my Star Trek shrine and it would look awesome in my new house. If I could, I would get them signed as well! I would hang this beautiful masterpiece on the wall, so it can remind me of how beautiful it is. I’ll frame it in my living room right next to my Mondo Mad Max: Fury Road and Man of Steel posters. My cat will be impressed! I’m new to the star trek universe, but I have loved it ever since I started. I want to start collecting and I feel like this would be a great way to usher that in! It would only be the beginning and would love to have it! Thanks! I’d save it as a Christmas gift for my sister as she loves Star Trek almost as much as I do! Would make a really nice addition to the wall display of my home theatre. I would frame it and hang it next to my 5 year (1969-1974) lunar landing anniversary post. I work in a long-term care mental health facility and as it so happens, I have come to know many Star Trek fans. I would get this poster framed and hang it in our common area so that the patients can admire it while we watch our favorite movies/ shows.